President Barack Obama called on the nation Monday to support and listen to its law enforcement officers as he bestowed the Medal of Valor on 13 officers who risked their lives to save others. 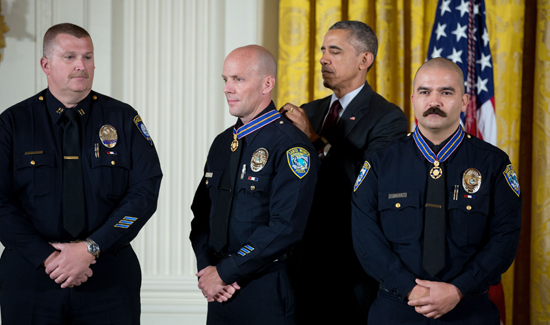 In a ceremony in the East Room, Obama draped the purple-and-gold ribbons around the necks of officers who intervened in shooting rampages, hostage situations and an armed robbery. He pledged to keep working toward a bipartisan overhaul to make the criminal justice system fairer, smarter and more effective so that officers are well-equipped to enforce the country’s laws. * Miami-Dade police Officer Mario Gutierrez, who was stabbed multiple times while subduing a knife-wielding man who tried to set off a massive gas explosion that could have caused massive casualties. * Johnson City, New York, Patrolman Louis Cioci, who chased and captured at a crowded hospital a gunman who had just killed a fellow officer. Investigators believe Cioci saved the lives of hospital staff, patients and visitors. * Los Angeles police Officer Donald Thompson for, while off duty, crossing two freeway dividers and braving first- and second-degree burns while pulling an unconscious man from a burning car to safety. * Omaha, Nebraska, police Officer Coral Walker, who shot and killed a man who had killed and injured multiple people during a shooting rampage. * North Miami, Florida, police Officer Niel Johnson, who endured gunfire from an assault weapon in pursuing and capturing a man who had shot a Miami police officer and two bystanders. * FBI Special Agent Tyler Call, who while off duty with his family helped rescue a woman whose ex-husband was holding her at gunpoint. * Niagara County, New York, sheriff’s Deputy Joey Tortorella, who confronted and subdued a gunman who had shot and wounded his parents inside their home, preventing the gunman from threatening the safety of students at a nearby elementary school.